Downtown Providence has a long and surprising association with the LGBTQ community. As part of the 2018 RI Statewide Preservation Conference, I was a member of a small team that created what we believe is the first-ever LGBTQ History Tour of Downtown Providence. This was one of several conference tours meant to highlight the diverse cultural heritage of Rhode Island and to provoke preservation of the sites and stories that bring that heritage to life. We owe a debt of gratitude to Kate Monteiro, a well-known gay rights activist and historian, for sharing her research with us. Other team members were Joanna Doherty, Kate Wells and Angela DiVeglia. LGBTQ history, like the histories of other marginalized or under-recognized groups, can be difficult to document and confirm. Some of these stories may or may not speak to LGBTQ history as we think of it today, but each of them is instructive in its own right. When creating tours, it is important to clarify what is fact, what is speculation and what new information is needed to fully inform the research. The earliest story involves Charley Parkhurst, a coachman at several Providence hotels in the 1830s–1840s and later one of the finest stage coach drivers on the West Coast. When he died in 1879, at the age of 67, it was discovered that he was anatomically female, and had been living as a man for decades. Did Parkhurst identify as male, and dress as a man as a result? Did Parkhurst identify as female, but find that it was easier to make a living disguised as a man? These are provocative questions with no conclusive answer. The tour around downtown Providence meanders through time and space. Many of the sites no longer exist, having been replaced by other buildings (or parking lots). These include Vaudeville theaters that featured extravagant performances by drag queens and drag kings, with stylish audience members dressed in gender-bending fashion as well. 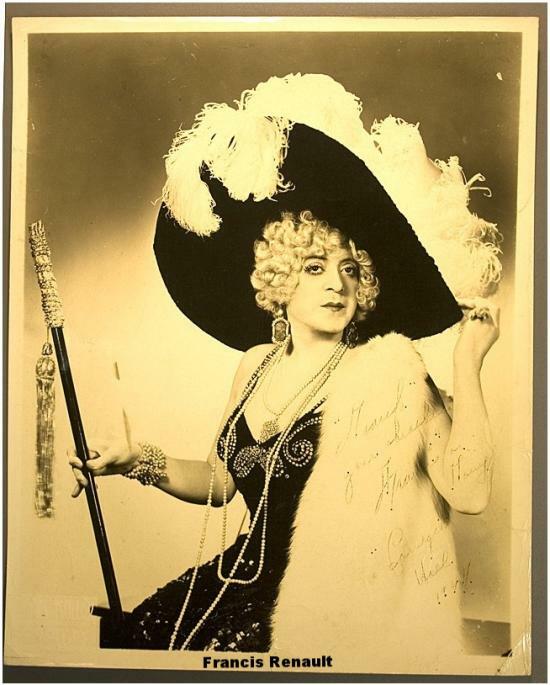 One of the most famous female impersonators of the early 20th century, Francis Renault, was born Antonio Auriemma in Naples, Italy and grew up in Providence. 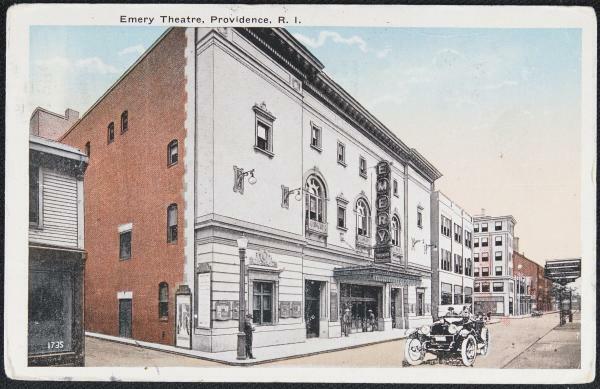 He began performing under the name Auriema in Providence’s theaters before adopting the name Francis Renault in late 1914. He was particularly known for his lavish wardrobe, which was often displayed in the theater’s lobby for his fans to admire before performances. It was rumored that his collection of dresses and accessories was worth $5,000 — the equivalent of about $65,000 today. Sites also include places where gay men socialized in the second and third decades of the 20th century. One of these, the CBC, a bath house on Weybosset Street, offered HIV testing and AIDS risk reduction education as early as 1983, and was the site of a notorious police raid, which was so unjustified it resulted in a consent decree: The police “were permanently enjoined from entering or being near the entrance of the all-male club for the sole purpose of intimidating and/or threatening persons wishing to enter or leave the establishment.” This act helped reduce police harassment of gay men in downtown Providence. The Mirabar, Rhode Island’s oldest gay bar, opened in Woonsocket in 1947 and operated at several sites, including at 95 Clemence Street in the 1960s, where it had an alert system for the second floor dance area in case of raids. Numerous buildings on the tour were once owned by members of Providence’s Chinese-American community, including the Gold Coin Lounge (79 Dorrance Street), which was featured in the Guild Guide, an important mid century reference guide to places for gay people to socialize. The current location of Alley Cat and Dark Lady (17 Snow Street) was once owned by the Chinese Merchant’s Association. The culmination of the tour includes sites associated with civil rights activities. Kennedy Plaza played host to the first RI Pride parade in 1976. The Old State House was the site of a gathering in 1976 to discuss the fight for gay civil rights, while the current State House was the site of legislation approving “gay marriage” in Rhode Island. 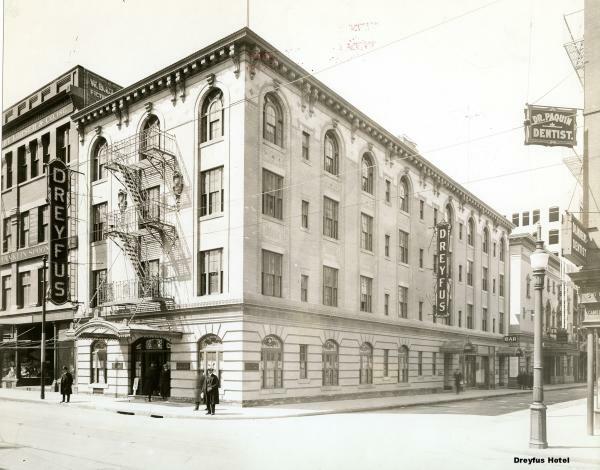 There is much more to learn about downtown Providence’s LGBTQ history. We have plans to create a digital tour, as well as a more regularly occurring tour, but no dates have been announced yet. 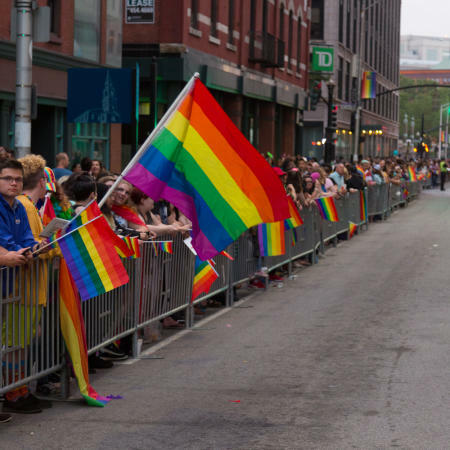 Click here for information on PrideFest and things to do in Providence. Brent Runyon became Executive Director of the Providence Preservation Society in October, 2013. Formed in 1956 to respond to the proposed demolition of a number of 18th- and early 19th-century houses on College Hill, the Providence Preservation Society (PPS) has grown from a small neighborhood group to a multifaceted citywide preservation organization. PPS works to improve Providence by advocating for historic preservation and the enhancement of its unique character through thoughtful design and planning. For more information, visit www.ppsri.org.